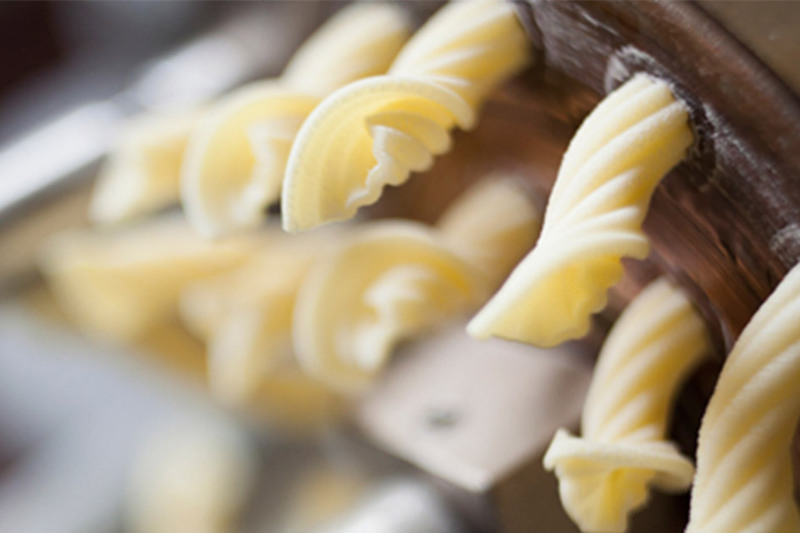 The Pastificio Baradello production and processing phases involve timeframes and rhythms typical of the pasta-making tradition. We strive to maintain the high quality of our product, dedicating all necessary attention to every single phase, from the preparation of the dough through to packaging. The dough is carefully prepared to ensure its correct structure in terms of protein content and to guarantee that it remains firm when cooked. Our machines’ vacuum system prevents the dough from oxidising. The cooling of the die prevents the dough from overheating and deteriorating, preserving its sensory qualities. The bronze die process gives the pasta its typically coarse and porous handmade look, enabling all kinds of sauces to cling to it. The static drying at low temperatures can last for up to 20 hours. Only through a slow drying process is it possible to preserve the colour, fragrance and flavour of the wheat. The products are packaged by hand to ensure they are not damaged in any way. Pastificio Baradello bags preserve the freshness of the pasta and are 100% recyclable.